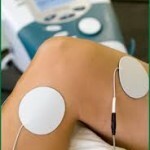 It is a low-level frequency electrical current, used in physiotherapy which works on pain relief. Its basic idea is that it works by reducing the perception of painful stimulus by numbing the neuromuscular junctions so that the brain doesn’t detect the otherwise painful toxic stimulus. Its is very like TENS (transcutaneous electrical neuromuscular stimulation) but has a stronger frequency. TENS is a machine, which patients often use at home to help with painful periods or can be used during labor. What is Interferential therapy commonly used for? If you have a condition that you think might benefit from this therapy, speak to your physiotherapist.